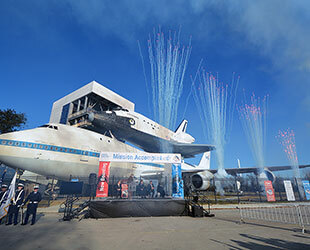 — Under a banner proclaiming "Mission Accomplished," Space Center Houston officials celebrated on Saturday (Jan. 23) the opening of Independence Plaza, a new $12 million exhibit featuring NASA's historic space shuttle-carrying jumbo jet topped by a full-size mock-up of the iconic winged orbiters. 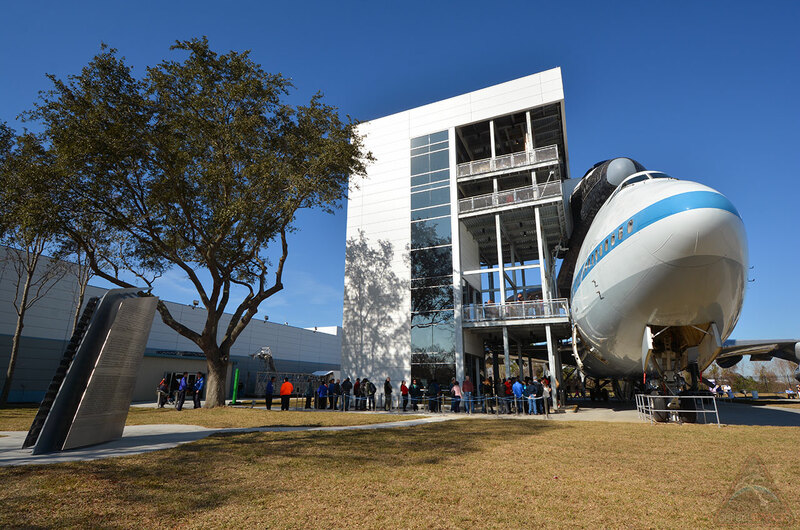 "With the ability to walk through both air [and spacecraft], you will experience a behind-the-scenes look at life in the shuttle era," said Richard Allen, the president and CEO of Space Center Houston. "It is a visitor experience that can't be found be found anywhere else in the world." 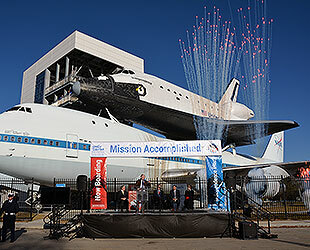 The centerpiece of Space Center Houston's Independence Plaza is NASA's original Shuttle Carrier Aircraft. Known by its tail number, NASA 905, the modified Boeing 747 jetliner was first used during tests in the late 1970s to prove that the orbiters could land safely back on Earth. It then ferried the shuttles piggyback across the United States, returning them to Florida from their landing sites and delivering them for servicing between missions. Mounted atop NASA 905 is "Independence," a high-fidelity, full-size shuttle mockup outfitted with a detailed interior of the cockpit, crew cabin and payload bay. "Space Center Houston has transformed the space shuttle exhibit. It is fully interactive, hands-on and is real," stated Fred Griffin, chairman of the board of the Manned Space Flight Education Foundation, the non-profit that owns and operates the space center. "Other cities may show a space shuttle, but in Houston we can experience it and walk in it and we can touch it." "When people go to New York City, they see the Statue of Liberty, in Paris, the Eiffel Tower and in Sydney, the Opera House. In Houston, it will be Independence Plaza," Griffin continued. "The image of Independence Plaza is destined to become iconic." On Saturday, guests with timed tickets waited to enter the mock shuttle's flight- and mid-decks, as even more queued to board elevators and ascend the access tower to board the Shuttle Carrier Aircraft for the first time. 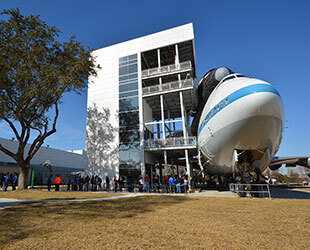 Once a mostly-empty shell, with the exception of added beams needed to support the weight of the orbiter, the fuselage of NASA 905 now houses a museum of hands-on exhibits. 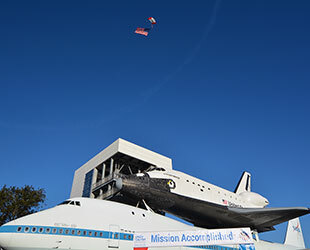 "This magnificent, interactive display — the largest single artifact of the 30-year shuttle program — will continue to inspire future generations and indeed many who visit this exhibit will become tomorrow's flight controllers, engineers, astronauts and scientists leading us into deep space," said Congressman Brian Babin (TX-36), who presented Space Center Houston with an American flag flown over the U.S. Capitol Building in honor of Independence Plaza. "I would like to congratulate you at Space Center Houston and the entire team who envisioned this display and made it happen," Babin said. 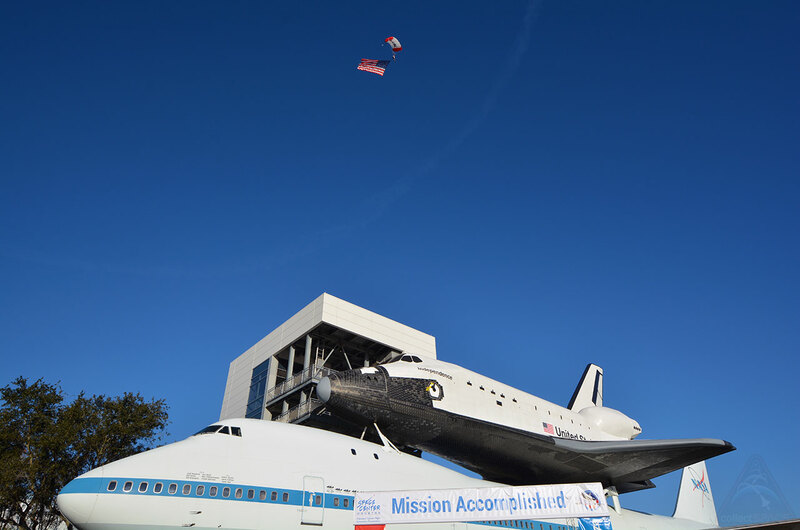 The plaza's leading sponsor is the Boeing Company, which originally built the jumbo jet and the space shuttle on which the replica Independence is based. In addition to financial support, Boeing provided its Aircraft on Ground engineers to disassemble and reassemble the Shuttle Carrier Aircraft as was needed to transport the tremendous airplane from the nearby Ellington Airport to the space center. "It was no small feat," said John Elbon, vice president and general manager of Boeing's Space Exploration division. "In fact, it was the first time in the history of the Aircraft on Ground team that they removed the wings of a 747 [in the field]. Special tooling and procedures were created just for that project." NASA's retired space shuttle orbiters are on display at the Smithsonian and at museums in California, New York and Florida, states that all made contributions to the program. But it was in Houston where it all began and was based. 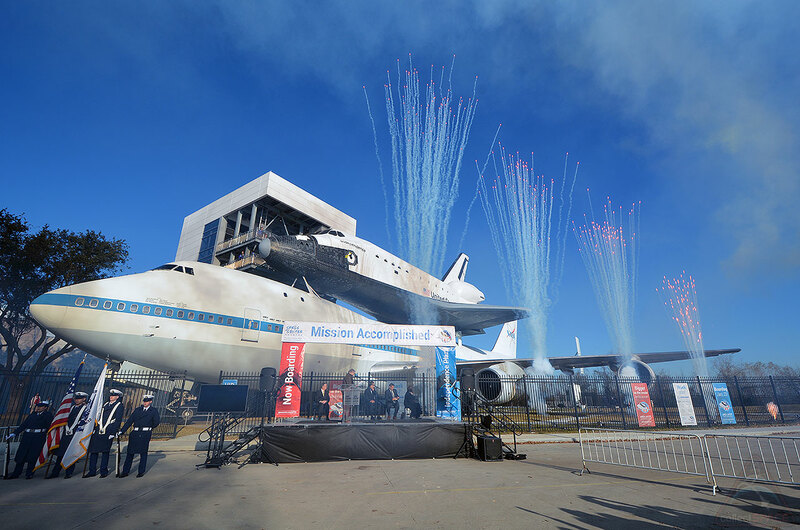 "Houston is the home of our country's human spaceflight program and so I am so excited that today we are opening Independence Plaza," Ellen Ochoa, the director of NASA's Johnson Space Center and a space shuttle astronaut who flew four missions, said. "Johnson Space Center designed and developed the space shuttle — including the concept of the Shuttle Carrier Aircraft — and we are the center that trained for and carried out all 135 shuttle missions." 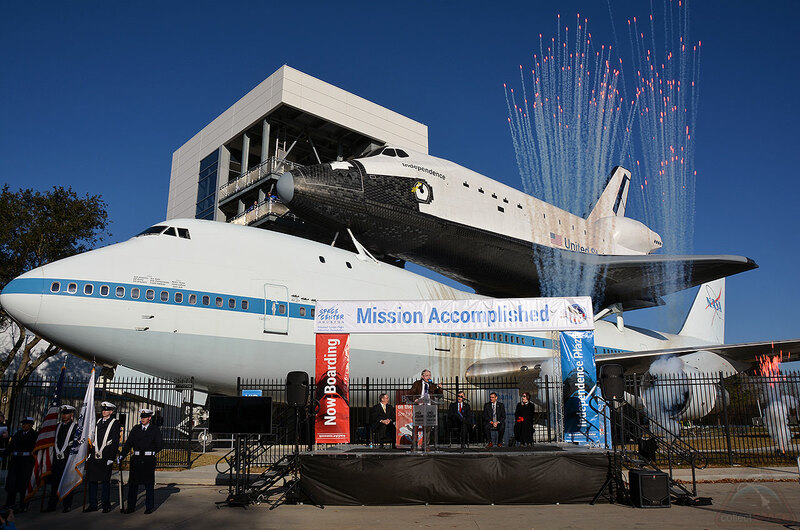 "Together, this aircraft and shuttle orbiter make an iconic display that Houston can proudly showcase to the world," Ochoa said. "A display I believe is destined to become the number one Texas attraction." Preview Independence Plaza in collectSPACE's inside and out, top to bottom first look photo gallery.